“…instead of the most impressive student film ever made, we had the least impressive professional film ever made”. This is how writer Dan O’Bannon described Dark Star, a zany space adventure that is far more influential to both film makers and the movie going public than most people are aware. The plot follows the crew of the deep space scout ship Dark Star as they travel the galaxy looking for unstable planets to demolish. As they continue their travels, their ship is falling apart around them, and due to their near light speed transits only three years has passed for them. This is one of my favorite B movies, hands down. It hits me in all the right places, from campy humor to science fiction adventure. It also tickles my geek fancy because so many people who became famous later were involved with this movie early in their career. There is lots of geek trivia to be found in this film. Although it was a student film that was expanded into a full length feature, as a B movie, the effects, writing and acting are really of a higher than expected quality. Dark Star was a stepping stone in the career of one of Hollywood’s most prolific, though maybe not best, directors. Originally, it was the master thesis for John Carpenter, later known for movies such as Halloween and Escape from New York. This movie really set the tone for the B movies for which Carpenter would become known and established a higher bar when it came to quality of B movies in the 70’s. Movies don’t necessarily have to be good to have an impact. Low budget films are often the perfect place for new talent to make their name. 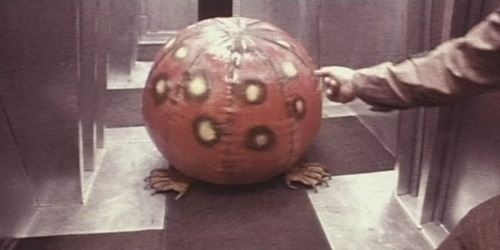 By today’s standards, Dark Star’s effects are unimpressive and beyond antiquated, but it was released in 1974, three years before Star Wars was released and changed the special effects game. While the movie obviously produced by people who were just starting out in their field of, the effects are campy without being over the top or just plain bad. Rather than try to be overly ambitious, the movie creators chose to stick with simple ones that could be pulled off with relative ease. Many of these effects were designed by Ron Cobb who would later gain notoriety for his work as a conceptual designer on many blockbuster films such as Star Wars, The Abyss, and of course Alien. Dark Star is the first film written by Dan O’Bannon, who would later go on to write Alien and Return of the Living Dead (the first movie in which zombies crave brains). The characters are reasonably well developed, especially O’Bannon’s own character of Pinback. As it turns out, Pinback isn’t actually Pinback. 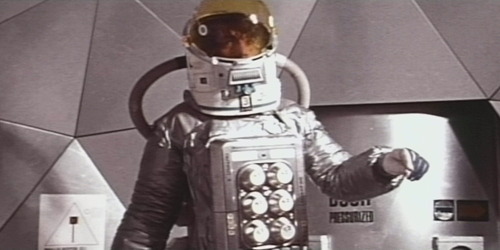 Instead he is Fuel Specialist Bill Frugge who was wearing Pinback’s spacesuit after the real Pinback committed suicide. When it came time for launch Frugge couldn’t figure out how to work the spacesuit’s radio to inform people that he wasn’t Pinback so he got shipped off instead. Being out of place, Pinback provides an amusing commentary on events and a significant lack of professionalism. Dark Star also provides a believable look into what life would be like for a crew stuck on a small spaceship for three years. The ship is falling apart, crew members have died, and those that remain have to stave off boredom and attempt to maintain their sanity. One crew member spends all his time in an observation dome look out at the stars and Pinback himself has adopted a pet alien. The alien is played by a painted beach ball with rubber monster claws for feet. The seams of the beach ball are even still visible underneath the paint. Despite this, the alien is still one of the best elements of this movie. 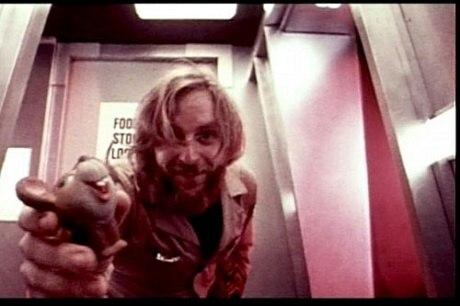 The scenes in which Pinback chases the alien through the ventilation system later became the inspiration for Alien. (Dark Star is basically the story of truck drivers in space as a dark comedy, whereas Alien makes that same idea into a beautiful horror film.) So while the beach ball alien bears no resemblance to the Xenomorph, it is, in fact, its early ancestor. If this cost more than $10 I’d be very surprised. There is very little about this film that I don’t enjoy. However, there are several times where the dialogue is too quiet because of that what is going on in the scene becomes lost. Since the plot is pretty thin that start this only serves to add confusion. The space suits are another complaint of mine. Most of the suit is fine—especially for low budget science fiction—but the chest pieces on both space suits are baking pans. I’m not joking here. One is most definitely a muffin pan and the other is a deep metal baking pan with an air filter attached to it. I know these guys were working with a limited budget, but have to believe that they could have scraped together an extra 20 bucks for some kind of busted electronics they could have used instead of such obviously recognizable household items. Tell me that isn’t a muffin pan. 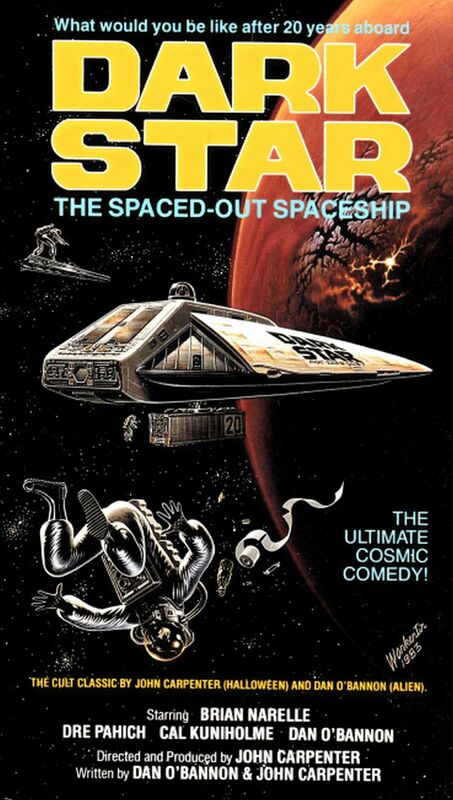 Dark Star is a B movie to be sure, but it is one of the truly outstanding ones. The number of people who got their starts on this movie and the other movies it has spawned or been referenced by gives this movie a longevity that would not be expected of what is essentially an overgrown student film. With everything that Dark Star has to offer, I give it 4.5 Death Stars.